The drug, commonly used to treat epilepsy, calms hyperactivity in the brain of patients with amnestic mild cognitive impairment (aMCI), a clinically recognized condition in which memory impairment is greater than expected for a person’s age and which greatly increases risk for Alzheimer’s dementia, according to the study published in March in Neurolmage: Clinical. The findings validate the Johns Hopkins team’s initial conclusions, published three years ago in the journal Neuron. They also closely match the results in animal studies performed by the team and scientists elsewhere. 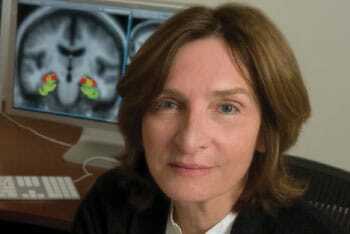 Lead investigator Michela Gallagher, the Krieger-Eisenhower Professor of Psychology and Neuroscience in the School of Arts and Sciences, hopes the therapy will be tested in a large-scale, longer-term clinical trial. Hippocampal overactivity is well-documented in patients with aMCI, and its occurrence predicts further cognitive decline and progression to Alzheimer’s dementia, Gallagher said. The team studied 84 subjects—17 of them were normal healthy aged participants, and the rest had the symptoms of pre-dementia memory loss defined as aMCI. Everyone was over 55 years old, with an average age of about 70. The subjects were given varying doses of the drug and also a placebo in a double-blind randomized trial. Researchers found low doses both improved memory performance and normalized the overactivity detected by functional magnetic resonance imaging that measures brain activity during a memory task. The ideal dosing found in this clinical study matched earlier preclinical studies in animal models. “What we want to discover now is whether treatment over a longer time will prevent further cognitive decline and delay or stop progression to Alzheimer’s dementia,” Gallagher said. Other team members from Johns Hopkins included Arnold Bakker, assistant professor of psychiatry and behavioral sciences; Marilyn S. Albert, director of the Division of Cognitive Neuroscience in the Department of Neurology; Gregory Krauss, professor of neurology; and Caroline L. Speck, the clinical study coordinator. Gallagher is the founder and a member of the scientific board of AgeneBio, a biotechnology company focused on developing treatments for diseases that affect brain function. The company is headquartered in Baltimore.